Get that someone special something different - an Australian 4x4 Driver Training Gift Certificate for one of our 4x4 Driver Training Courses or 4x4 Tag Along Tours. 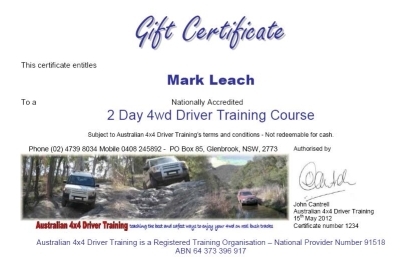 Gift Certificates can be purchased online using the form and Buy Now button below, they are either for a one driver one day 4wd driver training course, a one driver two day 4wd driver training course or a two drivers for two days driving course. The courses come either with or without a Nationally Accredited certificate recognised throughout Australia. The course is exactly the same, with or without the certificate, and most people doing the course for their own recreational training don't need the certificate so we pass on the administration cost savings of not issueing an uneccessary certificate to you. So the certificates are normally only required if the course is being undertaken for work related reasons. If you would like to spend a different amount or would like a 4wd Tag Along Tour Gift Certificate please give us a call. If you would rather not purchase the 4x4 gift certificate over the internet, or need it in a hurry, for that special persons special day give us a ring, normally the certificate will be sent to you by email within one working day but can be done quicker if needed.